Dirt racing's biggest stars converged on The Dirt Track at Charlotte for a dramatic double-dose of championship-deciding action in Saturday's high-octane finale to the World of Outlaws World Finals presented by Can-Am. A sold-out crowd of fans from 50 states and seven countries witnessed not one but two World of Outlaws Craftsman Sprint Cars, World of Outlaws Craftsman Late Models and Super DIRTcar Series big-block modified features after Friday's A-Mains were moved to Saturday. The delay meant that drivers and teams had to set up their cars to succeed in the warmer afternoon sunlight for one feature - and in the Saturday moonlight for the nightcap. With his 10th World of Outlaws Craftsman Sprint Cars championship locked up before the green flag, Donny Schatz raced to add to his remarkable tally of 21 wins this season. The spotlight in the first sprint feature fell on Ian Madsen. Madsen had no equal in the first of two Outlaw sprint features, as the Australian pulled away from Logan Schuchart after a series of late-race restarts to notch checkered flag No. 1 on the season. "It's an awesome feeling," Madsen said. "Every year we come here, this event gets bigger and bigger. I can't thank the fans enough for coming out in the daytime to watch some racing. Daytime racing is tricky. The lines keep changing and I had Logan (Schuchart) behind me. I know he's good at these types of tracks, so I had to just keep my line." Kyle Larson Racing driver Carson Macedo appeared to have the second Outlaw sprint feature in hand as the laps wound down and Schatz - who started 10th - seemed to be too far behind to challenge. Macedo, however, slapped the wall in Turn 2 with only seven laps left, opening the door for the series' new 10-time champion to punctuate his championship season in perfect fashion. Schatz restarted in the lead and withstood Logan Schuchart's move for the lead with two laps to go to register his 22nd triumph of the season. 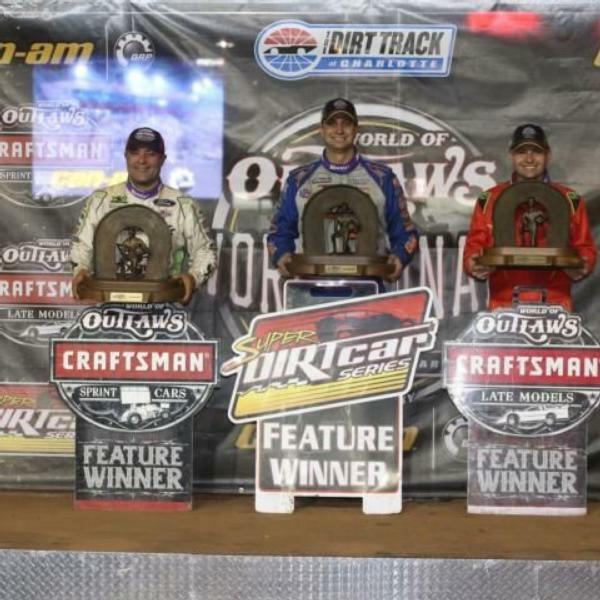 "Even the old guys can still get it done," Schatz said. "My car just kept getting better and better, and that's a credit to the guys on this Textron Off-Road car. I'm the hardest guy in the pit area to work for and I know it. When it's not working great, I'm not very nice. "With the yellow with seven to go, I thought, 'My car's just awesome. It's gonna take a while for somebody to be able to run me down,' but here came the No. 1S (Schuchart). He made a run at us. It's a good thing I didn't make too many mistakes. "(Winning the title) is pretty cool. When you look at your heroes, one of mine won 20 of them (Steve Kinser), so it feels like we've just started to scratch the surface. I don't know that anyone will ever touch that record, though. … My guys work extremely hard to keep us in (title-winning) position. There's a lot of young guys in this series that have a lot of talent and they keep me scratching my head." 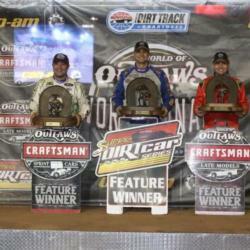 A hotly contested World of Outlaws Craftsman Late Models title fight came down to the final rounds. Chris Madden's bid for the Late Model crown went up in smoke on Lap 7 of the Friday-night makeup feature, when his black No. 44 machine pulled to the infield and out of contention with mechanical issues. Brandon Sheppard had no such problem, however. Sheppard delivered a small blow to Mike Marlar's points lead by leading Tim McCreadie to the checkered flag on Saturday afternoon - giving Sheppard his 37th career Outlaw Late Model win. "Our car was really maneuverable and my team gave me a great piece," Sheppard said. "The key was getting through lapped traffic. It got pretty tough there for a bit, but my team gave me a great, maneuverable car." Marlar had the last laugh, however, keeping Sheppard at bay for the crown on Saturday night. Marlar finished sixth in a race dominated by longtime late model standout Scott Bloomquist. "It's been an awesome year," Marlar said. "In (the first race on Saturday), I hated that for Chris (Madden). He's worked so hard. It's just God's will that it worked out for me. We've had our share of problems this year too, but we were a little bit more consistent. In tonight's race, we really had a winning car. I was grinding on my tires too much, so I thought, 'Hey, you're being really stupid here. Don't mess around and just finish.' I just made sure I finished. I'm the type of guy who likes to be aggressive all the time. We decided to be smooth, consistent and smart this time." Bloomquist wired the field in a stellar performance, beating Jonathan Davenport to the finish line by 7.21 seconds. "We were pretty good all weekend and we qualified good," Bloomquist said. "I left it too loose for the first feature. …I knew after that race (Saturday afternoon) pretty much what we needed to do. We discussed it with everybody but I was pretty confident that we knew what we needed to do tonight. This was an awesome crowd. I love coming here and racing. There's some tough, tough competition. A lot of good competitors in some good equipment." The first of two Super DIRTcar Series big-block modified features was a marathon 56-minute, caution-filled battle for survival that saw Brett Hearn lead the most laps en route to a stirring victory. Hearn had to hold off a hard-charging McCreadie, who made it to the rear of Hearn's car in Turn 4 but couldn't find a way past the leader. "It was a long 40 laps, I'll have to admit," Hearn said. "Open air and open track is priceless here. Once I had that, I knew it was totally on my shoulders. This is obviously a huge platform for us with the World of Outlaws. Obviously, there's a huge crowd from the northeast, which is great." Tim Fuller spoiled Matt Sheppard's hopes of a win and the title after Sheppard led the way in most of the second Super DIRTcar feature. Once Sheppard had to fight his way around lapped traffic, however, Fuller pounced, took the lead and sped to his third feature win at The Dirt Track at Charlotte. "All of our wins are special, but this one definitely is," Fuller said. "Matt's been on his game for several years now." Fuller edged Sheppard by .469 seconds after a race that ran the last 34 laps without a single caution flag. Sheppard celebrated his seventh series crown after the event concluded. "We had a great car tonight," Sheppard said. "So did Tim. I didn't know whether to be on the low side or the high side of the lapped cars and we got jammed up. It is what it is. We had a great race car throughout the day. That's three straight years we haven't finished worse than third here, I believe, and that's pretty darned good. "We came out on top. That says a lot about our team, our car and our guys. Seven championships, that's a pretty big number." Friday's Make-up Features: Super DIRTcar Series Big-Block Modifieds A-Main (40 laps): 1. 20 - Brett Hearn; 2. 39 - Tim McCreadie; 3. 9s - Matt Sheppard; 4. 7m - Michael Maresca; 5. 25r - Erick Rudolph; 6. 8 - Rick Scagliotta; 7. 19 - Tim Fuller; 8. 91 - Billy Decker; 9. 21a - Peter Britten; 10. 42p - Pat Ward; 11. 96 - Steve Bernard; 12. 66 - Matt Williamson; 13. 45F - Steve Feder; 14. 07 - Tim Kerr; 15. 21J - Danny Johnson; 16. 63 - Adam Roberts; 17. 6h - Max McLaughlin; 18. 111 - Demetrios Drellos; 19. 66x - Carey Terrence; 20. 6jh - Josh Hohenforst; 21. 88 - Mike Mahaney; 22. 21b - Yan Bussiere; 23. 65 - Scott Hitchen; 24. 98h - Jimmy Phelps; 25. 19m - Jessy Mueller; 26. 5H - Chris Hile; 27. 28z - Gary Lindberg; 28. 43 - Keith Flach; 29. 48T - Dave Rauscher; 30. 5st - Tyler Siri World of Outlaws Craftsman Late Models A-Main (50 laps): 1. 1 - Brandon Sheppard; 2. 39 - Tim McCreadie; 3. 157 - Mike Marlar; 4. 0 - Scott Bloomquist; 5. 9 - Devin Moran; 6. 14 - Darrell Lanigan; 7. 91 - Tyler Erb; 8. 18 - Chase Junghans; 9. 7r - Kent Robinson; 10. 17m - Dale McDowell; 11. 5 - Don O'Neal; 12. 2 - Joey Coulter; 13. 111 - Max Blair; 14. 12 - Jason Jameson; 15. 101 - Casey Roberts; 16. 89 - Justin Williams; 17. 28 - Dennis Erb Jr.; 18. 25 - Shane Clanton; 19. 7 - Rick Eckert; 20. 87 - Ross Bailes; 21. 72 - Jason Covert; 22. 54 - David Breazeale; 23. 11 - Pat Doar; 24. 43 - Tyler Bare; 25. 21K - Dakotah Knuckles; 26. 4 - Jackie Boggs; 27. 99 - Boom Briggs; 28. 44 - Chris Madden; 29. B1 - Brent Larson World of Outlaws Craftsman Sprint Cars A-Main (30 Laps): 1. 18 - Ian Madsen; 2. 49X - Tim Shaffer; 3. 1S - Logan Schuchart; 4. 39 - Spencer Bayston; 5. W20 - Greg Wilson; 6. 5 - David Gravel; 7. 83 - Cory Eliason; 8. 22 - Carson Macedo; 9. 87 - Aaron Reutzel; 10. 15 - Donny Schatz; 11. 49 - Brad Sweet; 12. 4 - Kasey Kahne; 13. 5M - Kerry Madsen; 14. 9 - Daryn Pittman; 15. 71 - Giovanni Scelzi; 16. 11K - Kraig Kinser; 17. 1A -Jacob Allen; 18. 41 - Joey Saldana; 19. 17 - Sheldon Haudenschild; 20. 19 - Brent Marks; 21. 3Z - Brock Zearfoss; 22. 13 - Paul McMahan; 23. 7S - Jason Sides; 24. 44 - Trey Starks; 25. 71X - Dominic Scelzi; 26. 71P - Parker Prince-Miller; 27. 19P - Paige Polyak; 28. 2 - Shane Stewart; 29. 21 - Brian Brown Saturday's Features: Super DIRTcar Series Big-Block Modifieds A-Main (40 laps): 1. 19 - Tim Fuller; 2. 9s - Matt Sheppard; 3. 91 - Billy Decker; 4. 20 - Brett Hearn; 5. 111- Demetrois Drellos; 6. 39 - Tim McCreadie; 7. 6h - Max McLaughlin; 8. 21a - Peter Britten; 9. 66 - Mat Williamson; 10. 43 - Keith Flach; 11. 98h - Jimmy Phelps; 12. 96 - Steve Bernard; 13. 19w - Justin Wright; 14. 7m - Michael Maresca; 15. 25 - Stewart Friesen; 16. 19m - Jessy Mueller; 17. 88 - Mike Mahaney; 18. 3 - Justin Haers; 19. 07 - Tim Kerr; 20. 25r - Erick Rudolph; 21. 5st - Tyler Siri; 22. 21b - Yan Bussiere; 23. 42p - Pat Ward; 24. 8 - Rich Scagliotta; 25. 63 - Adam Roberts; 26. 25J - Chad Jeseo; 27. 48T - Dave Rauscher; 28. 21J - Danny Johnson; 29. 18Jr - Louie Jackson Jr.; 30. 66x- Carey Terrence; 31. 28z - Gary Lindberg World of Outlaws Craftsman Sprint Cars A-Main (30 Laps): 1. 15 - Donny Schatz; 2. 1S - Logan Schuchart; 3. 49 - Brad Sweet; 4. 49X - Tim Shaffer; 5. 71 - Giovanni Scelzi; 6. 39 - Spencer Bayston; 7. 5 - David Gravel; 8. 5M - Kerry Madsen; 9. 41 - Joey Saldana; 10. 71P - Parker Price-Miller; 11. 2 - Shane Stewart; 12. 17 - Sheldon Haudenschild; 13. 11K - Kraig Kinser; 14. 18 - Ian Madsen; 15. 9 - Daryn Pittman; 16. 21 - Brian Brown; 17. 7S - Jason Sides; 18. 71X - Dominic Scelzi; 19. 87 - Aaron Reutzel; 20. 13 - Paul McMahan; 21. 19 - Brent Marks; 22. 83 - Cory Eliason; 23. W20 - Greg Wilson; 24. 3Z - Brock Zearfoss; 25. 1A - Jacob Allen; 26. 17A - Austin McCarl; 27. 22 - Carson Macedo; 28. 15H - Sam Hafertepe World of Outlaws Craftsman Late Models A-Main (50 laps): 1. 0 - Scott Bloomquist; 2. 49 - Jonathan Davenport; 3. 1 - Brandon Sheppard; 4. 18c - Chase Junghans; 5. 39 - Tim McCreadie; 6. 157 - Mike Marlar; 7. 22 - Chris Ferguson; 8. 7k -Kent Robinson; 9. 1P - Earl Pearson Jr; 10. 9 - Devin Moran; 11. 44 - Chris Maden; 12. 101 - Casey Roberts; 13. 54 - David Breazeale; 14. 25 - Shane Clanton; 15. 28 - Dennis Erb Jr.; 16. 15s - Donny Schatz; 17. 20 - Jimmy Owens; 18. 7 - Rick Eckert; 19. 111r - Steven Roberts; 20. 89 - Justin Williams; 21. 21 - Benji Hicks; 22. 76 - Brandon Overton; 23. 17M - Dale McDowell; 24. 11 - Pat Doar; 25. 5 - Don O'Neal; 26. 4B - Jackie Boggs; 27. 91 - Tyler Erb; 28. B1 - Brent Larson.